Abstract: A software tool for generating Indium Tin Oxide patterns (ITO) for touch panel manufacturing is developed that reduces the layout development time and human errors in the process of generation of layouts. AnIndium Tin Oxide ITO design tool is developed which reduces the layout development time and human error in generating the design for transparent ITO layer before touch panel manufacturing. The tool requires the user to input the configuration parameters for the ITO design in tuning with Capacitive Touch devices to generate sensor patterns. The ITO layer design can be single layer or multiple layers depending on the application and Capacitive Touch Controller used in the end product such as a smartphone or tablet. The tool developed can be used by the chip vendor or module maker to design and study different ITO patterns and understand the behavior. Capacitive Touch Panel based display solutions have changed the face of consumer, industrial and healthcare segment products. Any electronic products coming in the market; be it smartphones, gaming applications, Electrocardiography (ECG) machines or remote controls of television capacitive touch haveenhanced the end user experience. A capacitive touch panel as shown in Figure 1is made up of different layers stacked on the top of each other with the module thickness notexceeding 1 mm. The total width of the glass panel is in the range of 1 mm which includes 0.7 mm of glass thickness (protective layer)and 0.26 mm for ITO layers which can be single layer or double layer. The top layer is protective layer followed by the ITO layers.ITO is a transparent conductive material on which the touch panel patterns for Drive and Sense lines are etched to form an array of capacitances between Drive-Sense nodes. ITO layer is present on the glass panel surface which detects the change in capacitance when touched by finger. The complete ITO surface is divided in matrix with X and Y channels for Sense and Drive respectively. The number of ITO layers for a capacitive touch panel varies from design to design. The factors affecting the number of ITO layers arePanel Maker’s Technology, Thickness of the module, Optical transparency, Touch Performance, Module cost and end customer requirement. · Display panel type: The display that is below the touch sensor can capacitively couple noise into the touch sensing layers. The touch panel pattern and stack up (presence of ground (GND) shield or air-gap between display and touch layers) can affect the touch performance in the system. Some sources of LCD (Liquid Crystal Display) noise are listed below in order of highest to lowest noise levels. AC VCOM noise is more severe than DC VCOM noise. The display noise is dependent on type of LCD and also the display image (for example gray color pattern is most noisy). The display noise frequency can be in same range as touch scan frequency thus corrupting the touch signal and so display noise must be handled properly by touch panel design and touch screen controller ASIC chip. · ITO layer: It can be Single layer or Double layer with or without GND shieldin each case. GND shield provides a shielding of ITO from the noisy LCD however this adds to module thickness as an extra GND shield layer is required in the module stack up. The touch sensor patterncan also be designed such that itminimizes the noise coupled to touch sensor and in addition the touch controller is also able to filter away this undesirable LCD noise. · Performance Factor depends on Finger Separationas shown inFigure 4and Report Rate. Finger separation means how closely the user brings two fingers together before the device recognizes them as a single touch. It is especially used for zoom/pinch gestures. The finger separation is also dependent on touch sensor design and touch controller firmware. While report rate determines the response time of the touch controller to user finger inputs. This depends on the scanning architecture which in turn may depend on number of Drive and Sense lines. 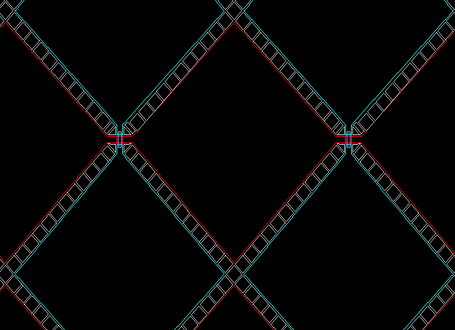 · Linearity:Linearity measures how “straight “a line can be drawn across the screen. Linearity depends on both touch screen controller and also screen pattern design. It should be accurate within +/- 1.0 mm.The linearity is the ability of touch controller to follow the finger or pen motion on the sensor reliably over the entire area of the panel. The edge design of the panel can be controlled to improve the linearity on the edges of the panel. 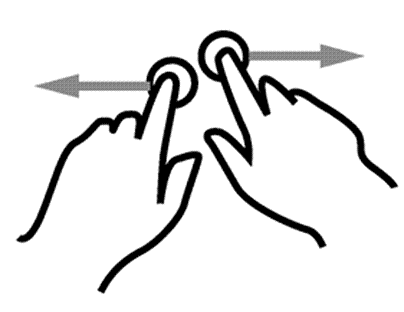 · Accuracy: The accuracy determines the precision of touch position based on finger location on the screen. 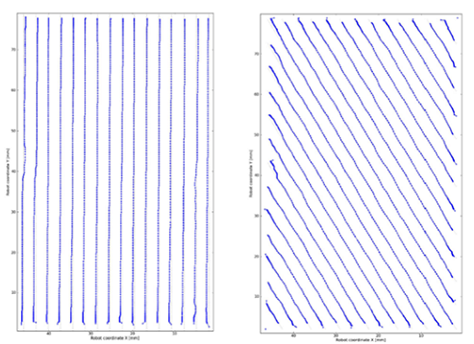 The pattern design can also affect the skewness or symmetry of the final XY position data based on XY sensor design. 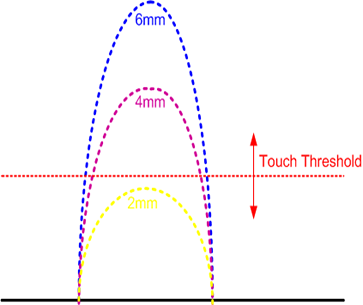 · Minimum finger size: The minimum finger size is the minimum detectable areathat can be uniquely reported by the touch controller.The minimum finger size that can be detected depends both on the sensor pitch and on controller designFigure 6and Figure 7show the pictorial representation. · Signal-to-noise ratio:To get reliable and robust performance of touch, a certain level of signal-to-noise ratio is desired.Signal-to-noise ratio is defined as the ratio between a signal and the background noise.A higher signal to noise ratio is able to differentiate between signal and noise that helps in providing high noise immunity in a touch system. The Sense pattern can also help to improve the signal-to-noiseratio by causing touch strength to increase moresince a larger sensor area will cause more capacitance change when finger comes in contact with Sense pattern. As seen from above performance attributes, most of the above touch performance factorsare governed by the ITO design pattern. Developing a design pattern for ITO layer is a tedious task which requires a Computer-aided design (CAD) design expert to make a number of iterationsof the design before generating the final output to beprovided further to the CAD manufacturer to get it printed on the panel. 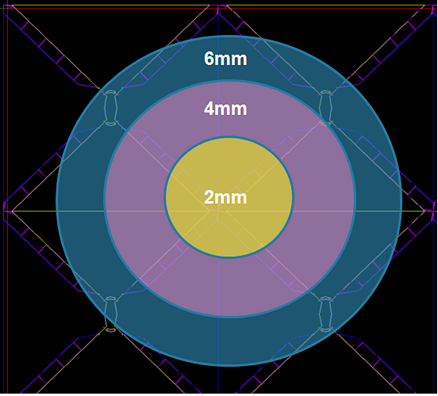 Traditionally ITO design calculations are performed on a spread sheet and supplied to CAD experts who draw the design to get an output which can be directly printed on Glass/Film or PET [Polyethylene terephthalate] transparent substrates. Since there are two levels of designing [a) Systems Engineers working for the ITO layer b) CAD engineers developing the ITO design], feedback loop is time consuming. The ITO Capacitive Touch Sensor design tool kit is one of the unique tools of its kind which allows the user to generate different Touch Screen ITO design patterns by entering the required electrical and sensor design parameters. The input parameters for the tool are Diagonal Size, Aspect ratio, Sensor Pitch, Optically Clear Adhesive (OCA)relative permittivity, RX to TX Optically Clear Adhesive thickness, ITO electrode Resistivity, Silver Metal Resistivity, TX to LCD gap, Cover Glass thickness and glass permittivity and air permittivity. Based on these inputs all the parameters for the Capacitive Touch Panel are calculated which includes number of Force which is TX and Sensewhich is RX, Capacitance and Resistance of one RX node and one TX node of the ITO design. These parameters are tuned to work with STMicroelectronics Capacitive Touch Sensor. The Sensor Tool Kit allows generating ITO pattern for capacitive touch panel to give best output with ST STMTxx Capacitive Touch Sensor device. With the commercially available tools the user needs to develop the ITO design pattern manually which may take weeks to finish the job for first iteration. The metal traces can be generated on either side by making appropriate selections in the tool. Scale measurement tool is provided to measure the dimensions pitch, diagonal size etc. of the ITO design. Dimension can be measured between two points at the click of the mouse. The System designer can view the ITO design pattern based on the inputs on the click of the button. The tool can also help a research and development engineer to generate ITO patterns and view the preview of the design instantly for his activityand also analyze the changes on the outcome by changing the input parameters. This will help the designers to generate the best ITO pattern in less iteration instantly. The output of the Sensor Tool Kit Software is a DXF file format which is standard format given by Autodesk. DXF file format is owned by Autodesk and it is taggedrepresentation of all the information contained in the AutoCAD drawing file. The ITO design pattern output is DXF file which can be opened in any standard tool that understands DXF file format. This helps the System designer to directly supply the DXF output which the panel manufacturer can easily use for panel production using our ST Finger Tip devices. The ITO Sensor design tool developed tries to bridges the gap between the Capacitive Touch Screen manufacturer andSTMicroelectronics. It provides an opportunity to STMicroelectronics to promote more and more design with their customer and the capacitive touch screen manufacturer gets a free tool to develop the ITO pattern before going for the production. This reduces the R&D cost for the panel manufacturer.